ER Advisor allows potential patients to enter their symptoms and find out what medical attention they need. 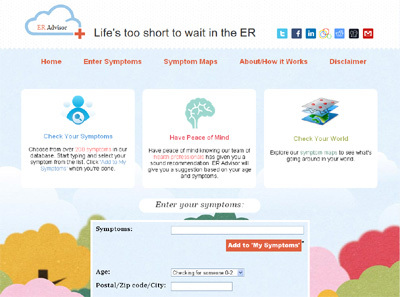 Users can also see what diseases/symptoms are going on around them. We use an algorithm developed by an epidemiologist and MD to make sure our recommendations are accurate and safe. We also track symptoms from various sources to keep and up-to-date picture of what is going around.